Move-in ready townhouse with fabulous updates. Main floor is totally remodeled. New flooring, lighting fixtures, double pane windows, doors, neutral paint, 16" insulation & more. Spacious light filled living room. Spectacular kitchen with cream & gray wood cabinets, granite counters, ss appliances, tile floor and breakfast bar. Dining area open to kitchen with access to large patio. 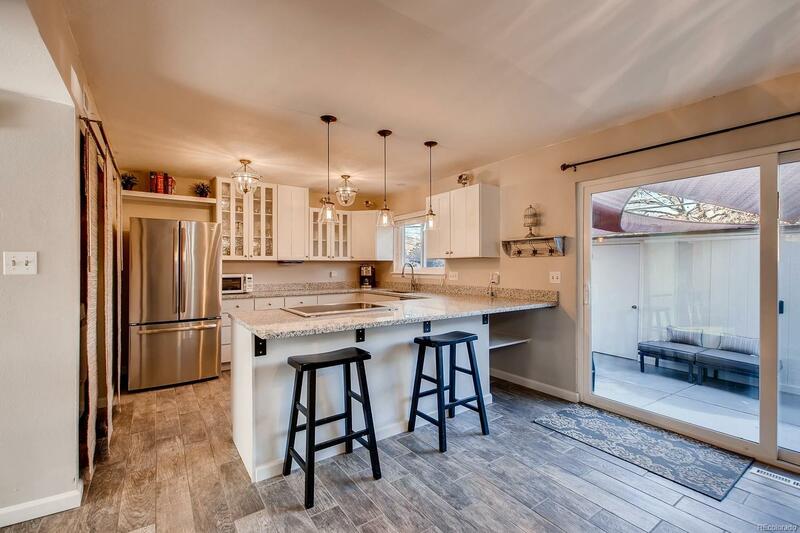 A beautiful remodeled main floor 1/2 bath. A huge master suite upstairs with 2 closets (1 walk-in) & its own bath. 2 additional bedrooms with a full bath. Great private fenced patio with storage shed, plenty of room for barbecues and entertaining. 2 + carport spaces behind unit. Green Mtn is a wonderful complex with lots of amenities; clubhouse, pool, fitness facility, playground & more. A great location minutes away from Light Rail Station, St. Anthony's, Fed Center, restaurants, shopping, parks, miles of open space hiking and biking trails and highways. Easy commute to downtown Denver & the mountains.